Infographic: How Does CMS’ New Methodology Impact Hospital Star Ratings? The number of hospitals that received the highest possible overall rating increased from 83 in December 2016 to 337 in December 2017 under CMS’ new methodology, according to a new infographic by Stroudwater Associates. The infographic examines 11 HCAPHS questions for a select group of hospitals and compares them against the selected peers and national benchmarks. 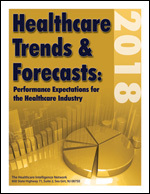 This entry was posted on Monday, February 5th, 2018 at 1:30 pm	and is filed under Healthcare Quality Ratings, Healthcare Trends, Hospitals, Infographics, Patient Satisfaction. You can follow any responses to this entry through the RSS 2.0 feed. Both comments and pings are currently closed.